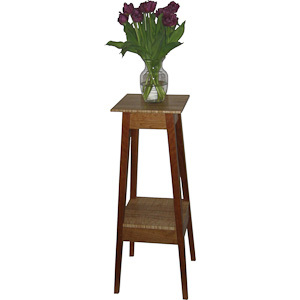 The beautiful and functional Boothbay plant stand has gentle tapered legs that splay out at a 5 degree angle on all sides. The legs and sides of the stand use mortise and tenon joinery for strength and are deocratively pegged. The 12" x 12" top and middle shelves are offered to hold a modest size plant or plants. The plant stand as shown is made from cherry for the main components and the shelves are constructed from hand picked decorative curly maple. The stand has a hand rubbed oil finish and the shelf tops have a waterproof varnish applied for added protection.You can use this stand display that special plant or flower. Any combination of woods can be used for the top and legs.